A selection of private residences that we have thatched. Private houses and buildings we have thatched. 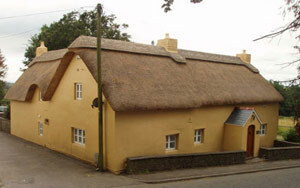 We have thatched many houses in a wide variety of materials including combed wheat reed and water reed. Our work takes us to all corners of the UK and occasionally abroad. 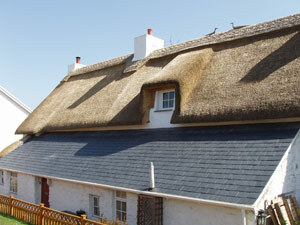 We pride ourselves in using where possible, locally sourced materials used in the vernacular style and can advise on any traditional local thatching styles in your area. Welsh longhouse, Vale of Glamorgan, Wales. This roof has been changed dramatically over the years with no original welsh thatch or timber work surviving. Residential dwelling - Bonvilstone, Vale of Glamorgan, Wales. Originally thatched with combed wheat reed, at some point in its life this roof had been re-thatched using water reed. The original wheat thatch had nearly all been stripped off at this stage. 300 year old dwelling, Suffolk, England. This small section of roof on a 300 year old row of cottages originally built as poor houses for the Hengrave estate in Suffolk has had a new lease of life. 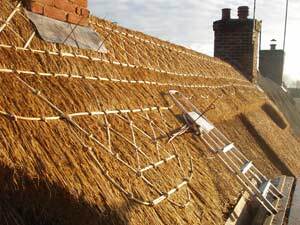 Historical, Traditional & Interpretational Thatching and Carpentry throughout the UK.